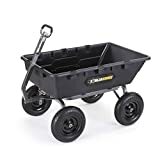 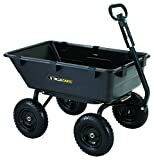 This cool new Gorilla Cart combines a wheelbarrow, a wagon, and a dump truck to become a heavy duty yard and garden cart with quick-release dumping action. 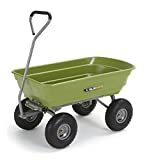 It features a 1200 pound capacity, rides upon 13 inch pneumatic tires, and has a 2-in-1 convertible handle that can either be pulled by hand or hooked up to a tractor or ATV allowing it to traverse any terrain from your backyard to a farm. 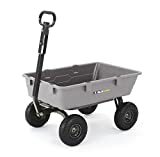 Best of all, not only does it easily dump its contents where you need it, it also won't tip over like a typical one-wheeled wheelbarrow. 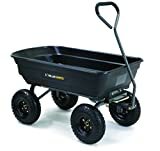 Great solution.